25 songs from top artists such as Kirk Franklin, Israel Houghton, Donnie McClurkin, Smokie Norful, CeCe Winans and others. Includes: Again I Say Rejoice  God Has Not 4Got  I Need You Now  Imagine Me  In Your Name  Open My Heart  Shackles (Praise You)  Turn It Around  Why Me  and more. 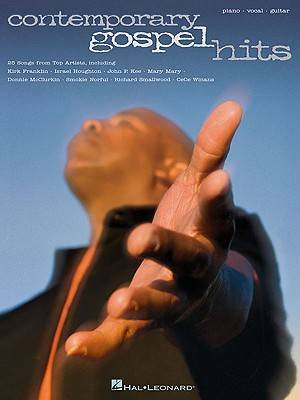 Contemporary Gospel Hits Piano/Vocal/Guitar Songbook was published by Hal Leonard in November 2009 and is our 30364th best seller. The ISBN for Contemporary Gospel Hits Piano/Vocal/Guitar Songbook is 9781423438830. Be the first to review Contemporary Gospel Hits Piano/Vocal/Guitar Songbook! Got a question? No problem! Just click here to ask us about Contemporary Gospel Hits Piano/Vocal/Guitar Songbook.